We spend a few pages as the Forever People recap their situation, stage a jailbreak, and get beaten down by Desaad’s guards and their vertigo grenades. 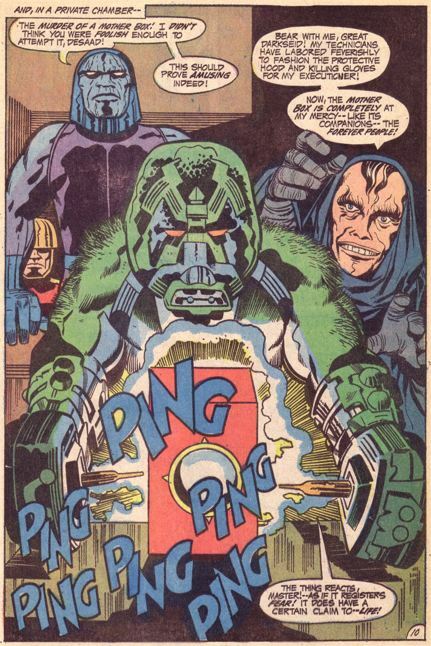 Pierced by the executioner’s electro-spikes, the Mother Box explodes. Yeesh. 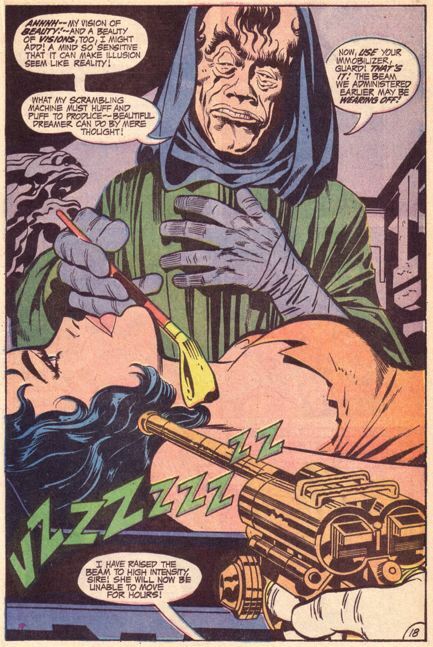 I’m surprised that Kirby passed up the opportunity to convert the riding crop into, I don’t know, a delta-discipline-prod. Meanwhile, the Mother Box materializes in front of a guy named Sonny Sumo, who we’ll see more of next issue. To hear Mark Evanier, Kirby’s apprentice at the time, tell the story, readers became increasingly frustrated at the price hike and the unwanted filler material. Comics, then sold at newsstands, became less commercially viable at the retail level, so newsstands cut down the space devoted to comics–keeping perennials like Superman and Batman, but ditching marginal titles like the brand-new Fourth World stuff. By the time DC scaled the comics down to 20 cents for 32 pages again, returning readers had missed almost a year’s worth of stories, and these closely interwoven titles just couldn’t survive. In hindsight, something like this was probably inevitable. Many super hero comics fail shortly after their debut, for any number of reasons. Kirby’s idea was to create a “mega-series” or something, a story built out of several individual titles. And while he intended the story to be finite, it was still going to be pretty long, at least several years’ worth of comics. If any one of those titles ran into sales problems and got cancelled, it would screw up the whole plan. It would be hard to predict this particular problem, but from a commercial standpoint what Kirby had proposed was extremely risky from the outset. You can bank a lot on your talent and reputation, but you can’t control everything. Even Grant Morrison’s Seven Soldiers project, a similarly dense micro-continuity spread over several titles, only ran for 4 months. Also, let’s talk for a second about pacing. 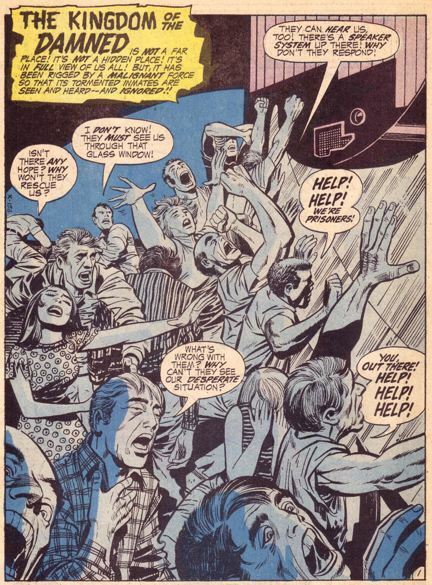 For Kirby, this is almost a filler issue: the Forever People begin trapped, stay trapped, and end trapped. But I really like it all the same. In my mind the more satisfying approach is to get rid of the intermediate stasis, or at least indicate that it’s extremely unstable, so that the issue-opening cliffhanger evolves into the issue-ending cliffhanger. 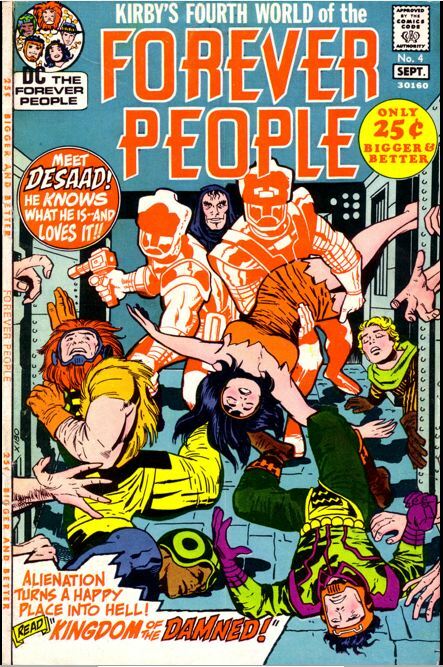 Forever People #3 ends with the kids losing their protector and falling into Desaad’s clutches; Forever People #4 takes them from mere captivity to torment. I really like that he constantly escalates the threat here, while also allowing some time to lend characterization to his villains. And this issue is all about villains. 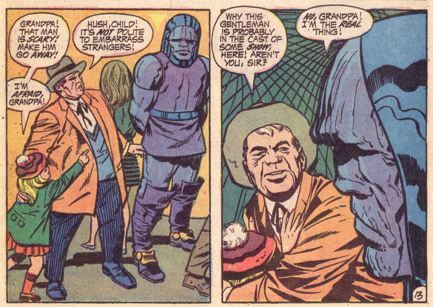 One of the cool things about Darkseid is that he appears in all of the Fourth World titles (okay, only by reference in Mister Miracle so far) and in almost every issue. 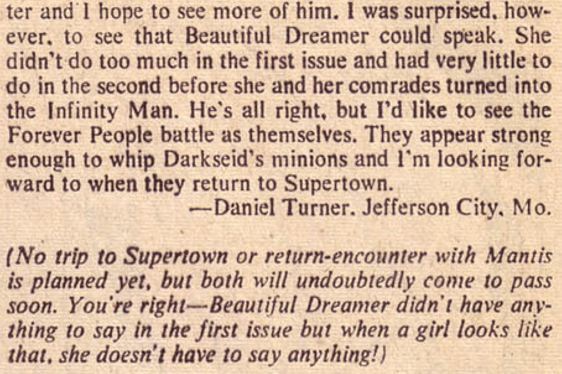 So you’re literally seeing Darkseid four times more often than you’re seeing Superman, Orion, or Jimmy Olsen. He’s acquiring weight and prominence due to constant emphasis. Amazingly, Kirby pulls this off without over-exposing the character to the point where, like Wolverine some fifteen years in the future, he loses all cachet. 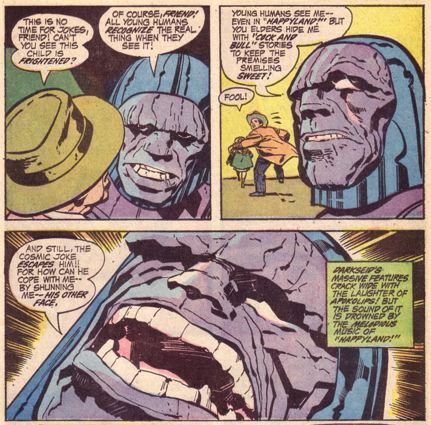 Part of this is that Darkseid is powerful (he blows up the Infinity Man), part of it is that he’s never truly defeated. But also, he’s a pretty cool character in his own right. In this issue he takes no interest in mere torture for its own sake–but of course doesn’t prevent it. He’s bored with ceremonial departures so he decides to stroll among the common folks at Disneyland Happyland. He respects children’s instincts, though he’s proud to terrify them–and he’s genuinely delighted by the adults’ capacity for self-delusion. 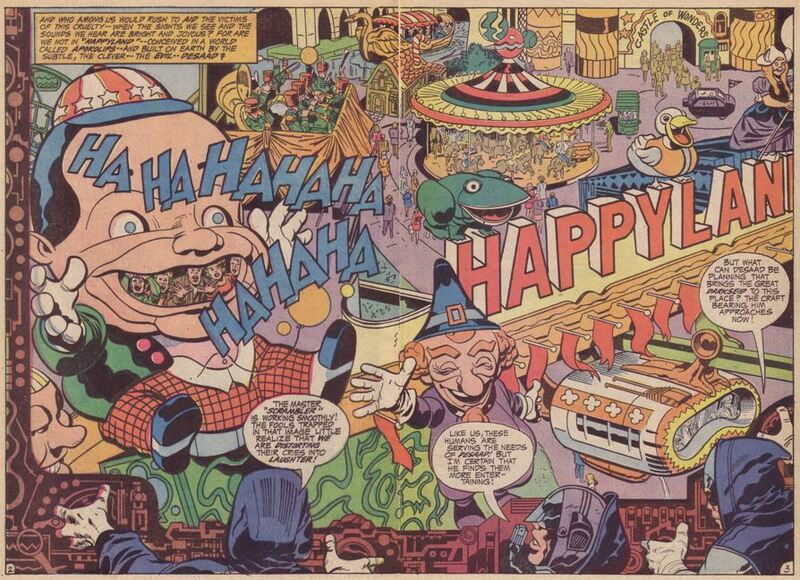 Darkseid’s sense of humor in this passage makes me wonder if Happyland in its entirety is constructed to make Darkseid happy: the whole thing is an exercise in hedonism heedless of horrors built into the experience. I may be bringing my own biases into it, but it’s hard to see Happyland as anything other than a critique of consumerism built on suffering. The entertainment literally blinds the guests to misery. And even once people know the truth, they retreat from it. 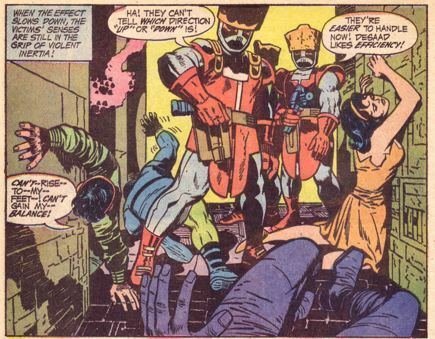 What bugs me is that she’s relegated to being a helpless captive twice in the first four issues, strapped helplessly to a table and brainwashed as the villain stands over her. This is, of course, Superheroics 101 stuff, but it’s nonetheless a little disappointing to a modern reader, and I am really looking forward to Kirby shattering this stereotype in a few weeks’ time. You said it, DC Comics! I really like the held line in orange for those flunkies on the cover. Thanks for including an excerpt from the letters page. I always find fan letters to be a great insight into how these stories were supposed to be received at the time. They can also be comedy gold.